Two Reflective Teachers: It's Monday! What are You Reading? Jen Vincent at Teach Mentor Texts and Kellee Moye and Ricki Ginsburg at Unleashing Readers cohost It's Monday! What are You Reading? weekly on their blogs. 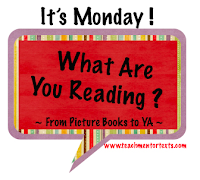 To see what others are reading and recommending each Monday, or to participate, be sure to head over to these blogs. 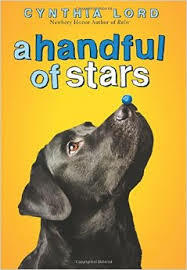 I love all of Cynthia Lord's books so I was so excited to read her new book, A Handful of Stars! I also heard and read so many great reviews about it so I found time this weekend to sit down and read it….and I read it in one sitting because I couldn't put the book down! This is an amazing story about friendship, importance of family, perseverance, creativity, and how to deal with the tough situations in life. This would be a perfect book to read aloud during a character unit and/or social issues unit, as well as a great book club book too. I can't wait to put this in the hands of students and teachers in the fall so they can meet and get to know Lily and Salma! In this story, Lily lives with her grandparents in Maine and she has a black Lab named Lucky who is blind. She meets Salma, a daughter of migrant workers who are working during the blueberry picking season, and their friendship becomes stronger and stronger throughout the book. They positively impact one another in so many ways and through their friendship, we learn so much more about each character. If you have this book in your stack like I've had for awhile, definitely move it to the top and begin reading it - enjoy! I just finished this book and it was awesome! The Unstoppable Writing Teacher: A Must-Have!